CASH-strapped Australians are having to resort to using their credit card to pay for everyday expenses and many can’t pay off their plastic bills in full each month. Alarmingly, new data revealed by budgeting firm Fox Symes found 52 per cent of Australians are having to resort to using their credit card to pay for utility and phone bills and even their groceries. About 58 per cent of cardholders also conceded that they cannot pay off their card in full each month which resulted in them incurring hefty interest costs. Shoppers are also being warned to think twice before signing up to interest-free deals after financial services firm Canstar’s Justine Davies labelled them “dangerous” if they don’t work out the true cost of the offer. “These zero per cent deals are for periods ranging from one month up to 24 months,’’ she said. Balance-transfer cards are when you transfer debt from one card to another and enjoy an interest-free period. Hundreds of these card offers and no finance purchase deals continue to flood the market — particularly around the end of financial year. 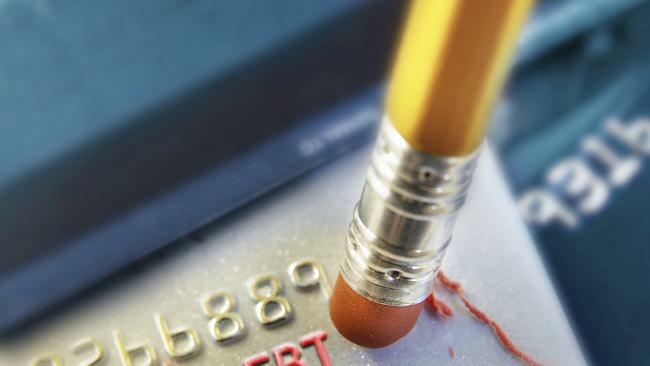 Reserve Bank of Australia figures show the nation’s credit card debt rests at a whopping $51.7 billion and more than $32.6 billion is accruing interest. New analysis crunched by financial services firm Canstar found there are more than 150 balance-transfer credit card deals on the market offering zero per cent honeymoon periods. Many car companies also offer low or no-interest finance deals but Ms Davies said this is where consumers can end up spending much more than intended. “If a customer is relying on a loan to purchase the goods at all then the customer is not in a strong negotiating position and the seller can charge a higher price,’’ she said.